We had a fabulous weekend. My parents were here, and on Saturday we colored eggs, we chatted, we took a tour around our house and checked all of the plants coming up this spring. We ate and ate and ate, it was wonderful. 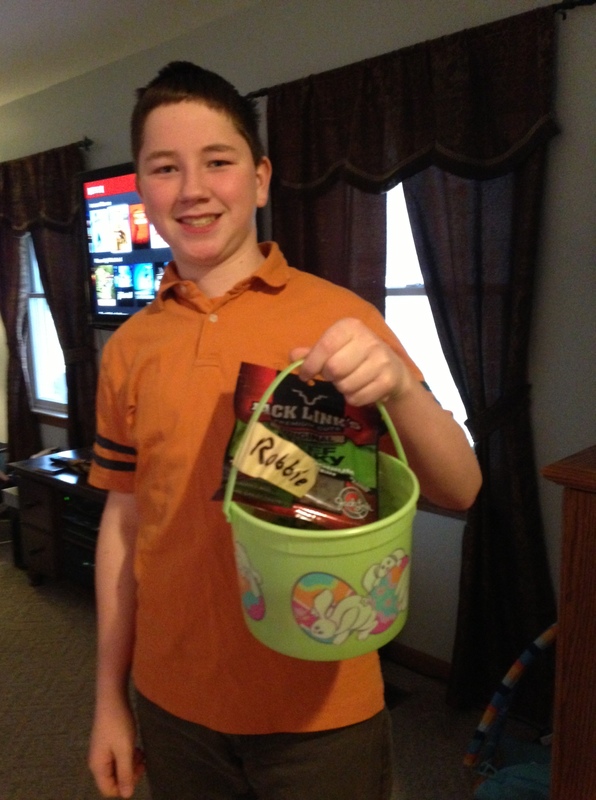 On Sunday morning we did church and then the kids found their Easter baskets, we had an egg hunt (with $ in the eggs), and we had our feast at 1pm. It was a very busy, but wonderful day. Sometimes it works out like this, and other times it doesn’t. I’m really glad this was an up year, it seems as if they have been mediocre lately. Here are some photos of our weekend. 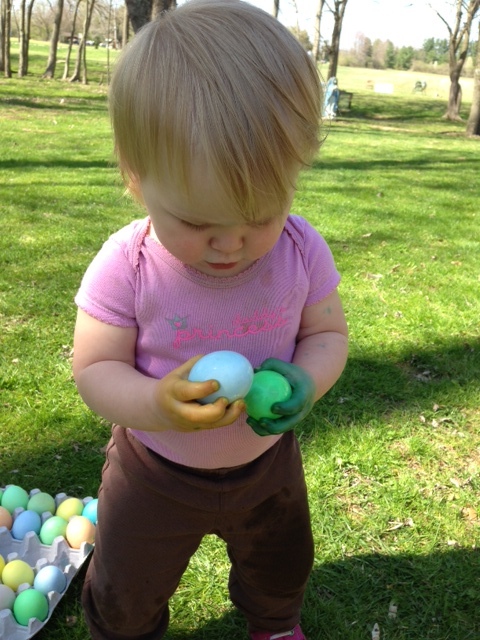 L’s first time coloring eggs. She loved it! 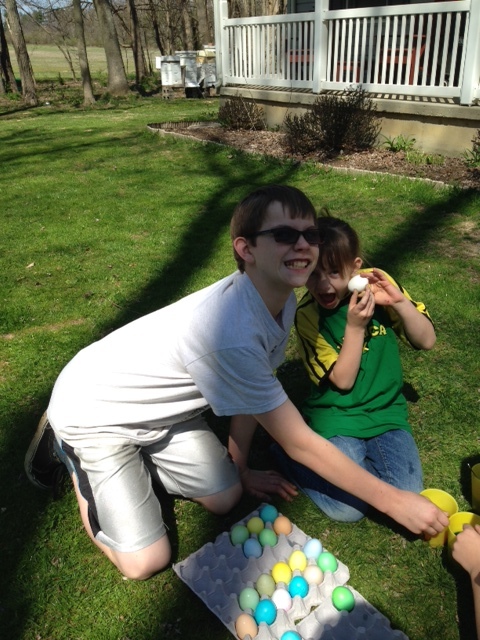 S with his favorite egg. 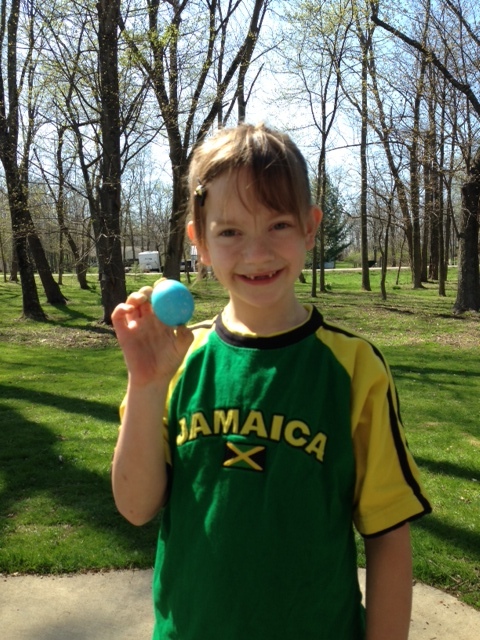 A with her favorite colored egg. L with her colored hands. I just love the green and yellow hands ! 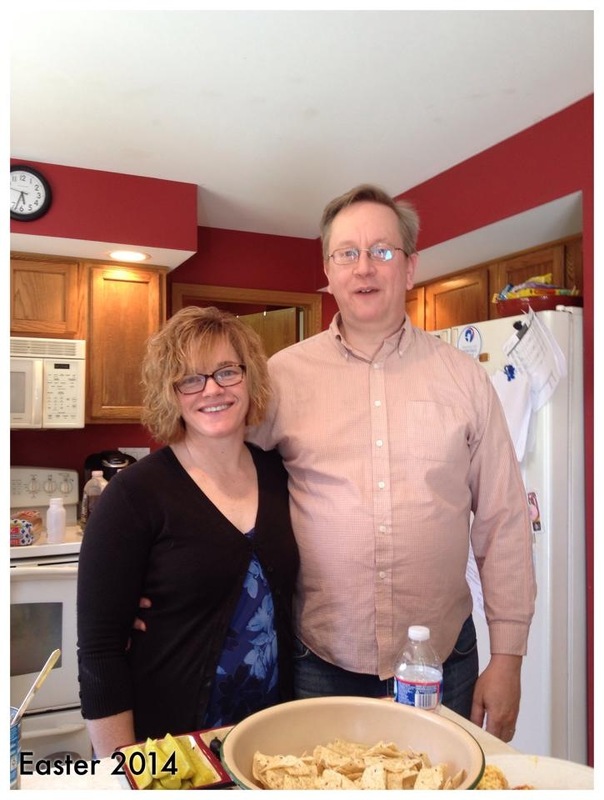 My husband and me on Easter Sunday. 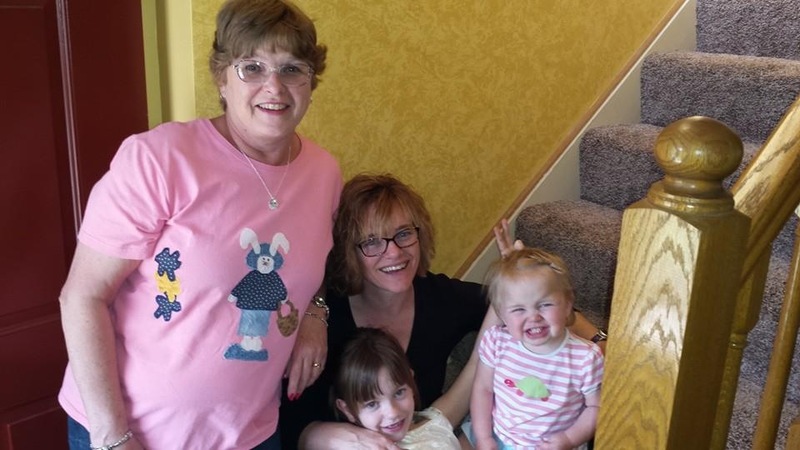 Me, my mom, and the girls. 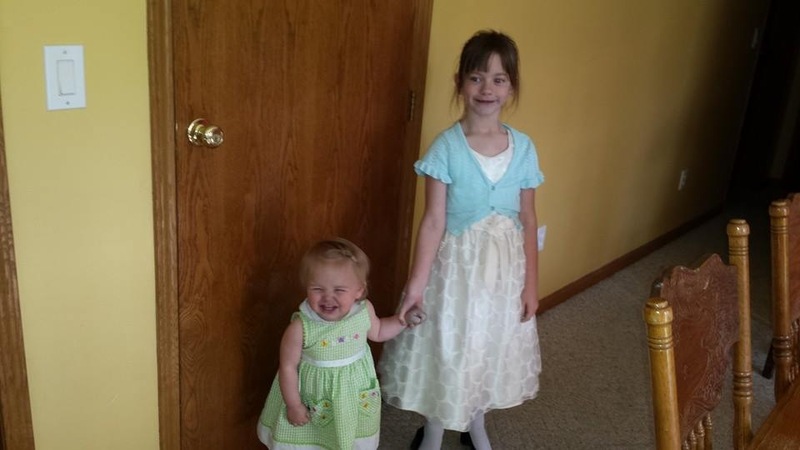 Easter Day with 2 beautiful girls. 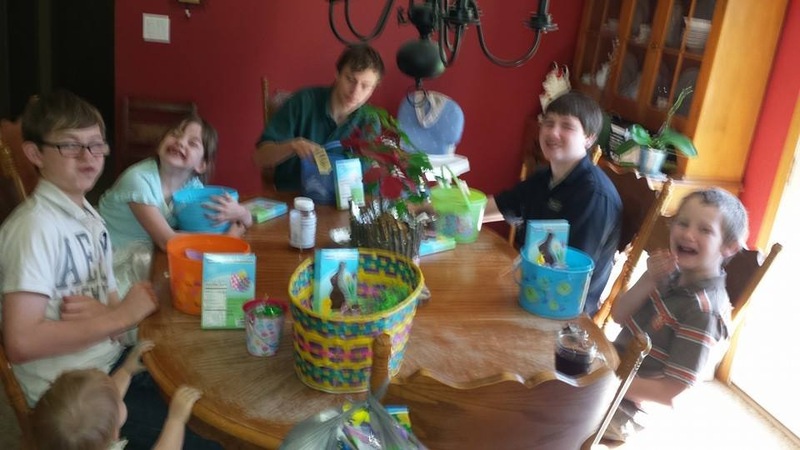 The kids enjoying some Easter candy after finding their baskets. 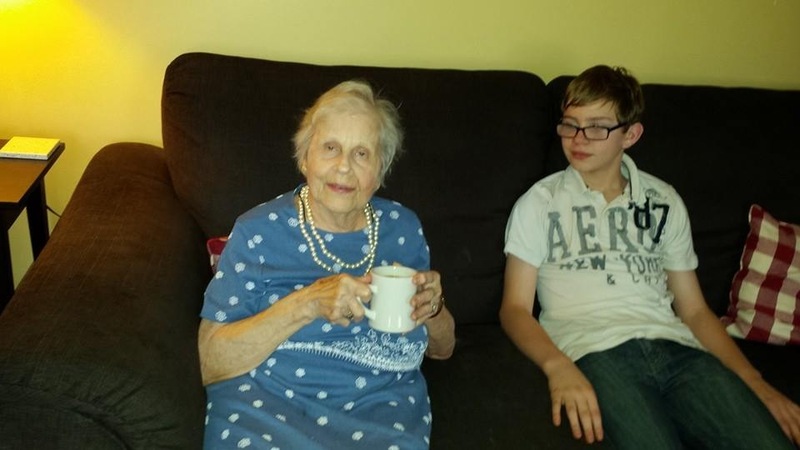 My mother-in-law enjoying a cup of coffee after dinner. 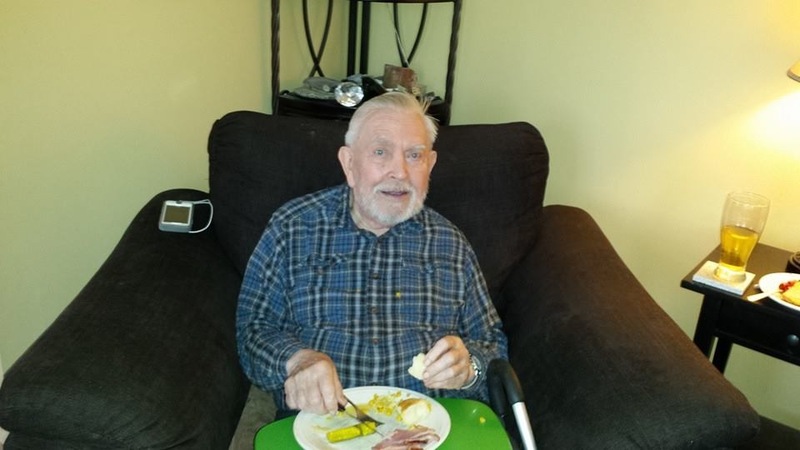 My father-in-law eating Easter dinner. I hope you all had a glorious Easter, we did! Sorry I’ve been gone, but with my husband gone last week, I’ve been a little lot busy! While he was gone wasn’t too bad, but as soon as he hit the door we have been running! Here is some of the stuff that has been going on in the last few weeks. A my 7-year-old daughter had her father/daughter dance with AHG. Here is a picture of them. All of the pictures had the sun in their eyes, so some my husband was smiling, but A, had her eyes closed. This was the best that I got at home. They had a great time. A ate too many sweets and had an upset stomach for some time during the dance. I need to remind her to limit her sweets next year! 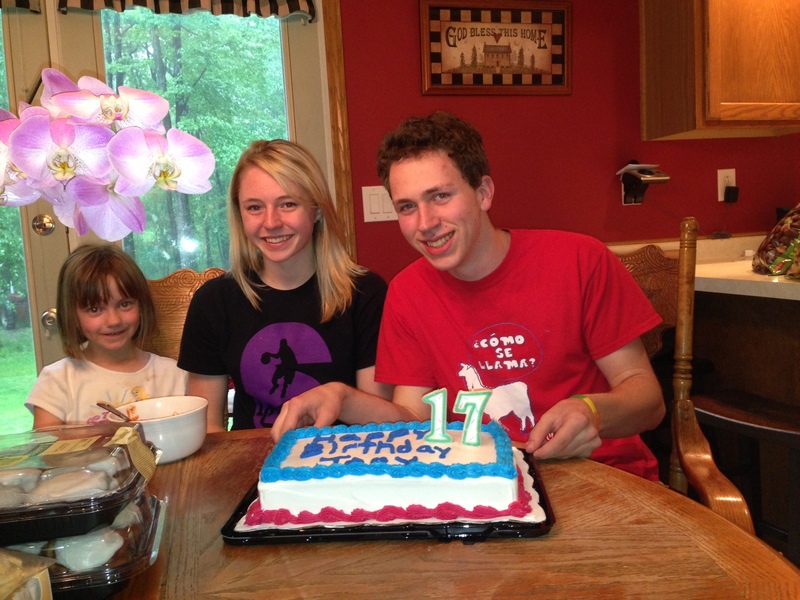 Also, we had 2 birthdays recently. 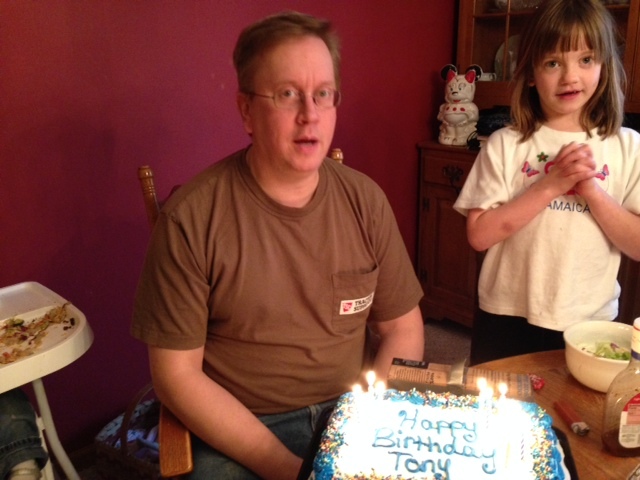 My husband turned 47! How can I be married to someone who is 47? Crazy! Right after my husband’s birthday is my son R’s birthday. He turned 15. Wow! 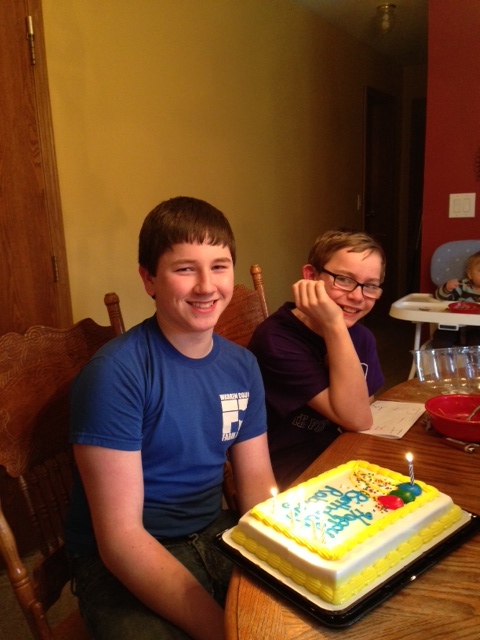 R’s 15th birthday with T in the background. 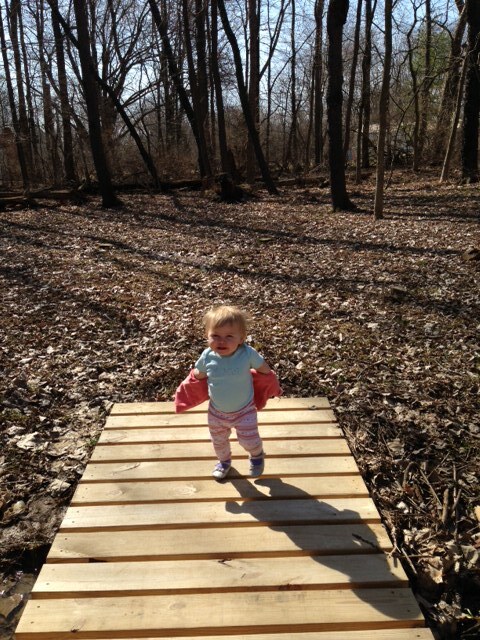 We have been outside when the weather is cooperating. 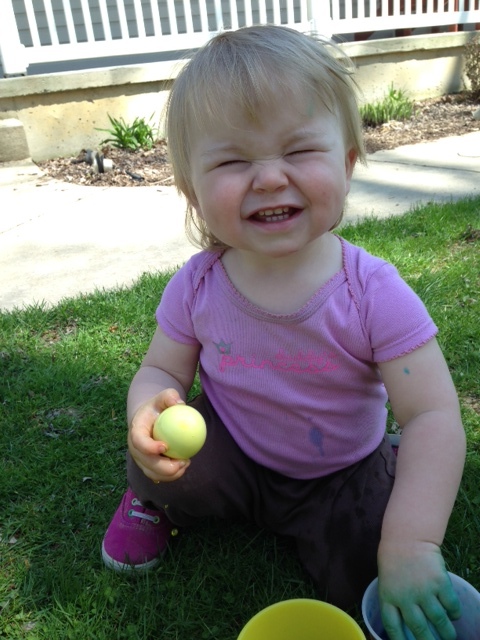 L loves being outside. It should be a fun summer! We got three chicks from a teacher at school. They are cute! L loved looking at them. When my husband took one out of the brooder to show her, she wanted to grab them. She about ripped the head off of one. We did want to get a picture of her with the chicks, but she was grabbing at the chicks and we were worried about their safety. Here she is distressed because she really wanted to hold a chick. 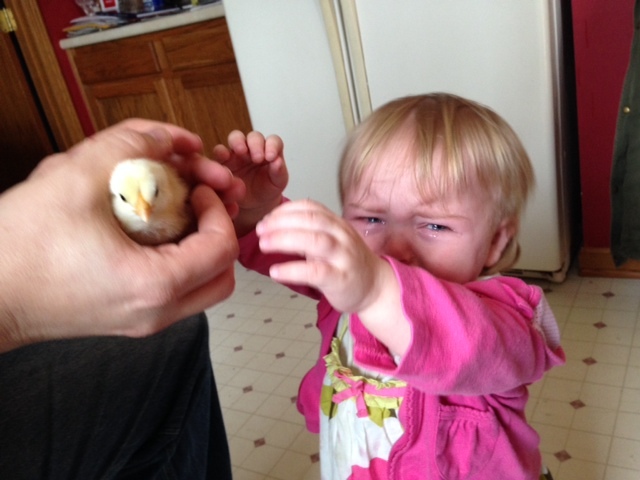 L crying because we wouldn’t let her hold the chick. She about killed it 10 seconds before this picture was taken. J, our oldest, and a senior in high school was named Salutatorian of his senior class. We are very excited and proud of his accomplishments! He should qualify for some additional scholarships because of this achievement. J was named Salutatorian of his senior class! 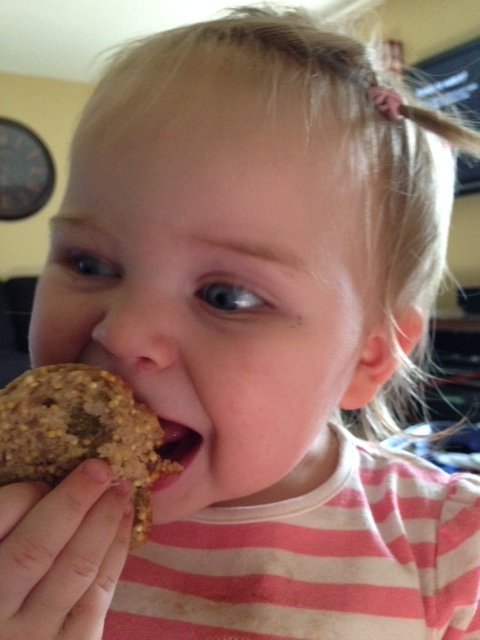 I just love this picture of L eating a muffin, so I had to add it! We had the chess tournament which was a Friday night and Saturday all day. The boys held up great. They didn’t do as well as they hoped, but now they realize that they need to keep practicing so that they improve for next year. 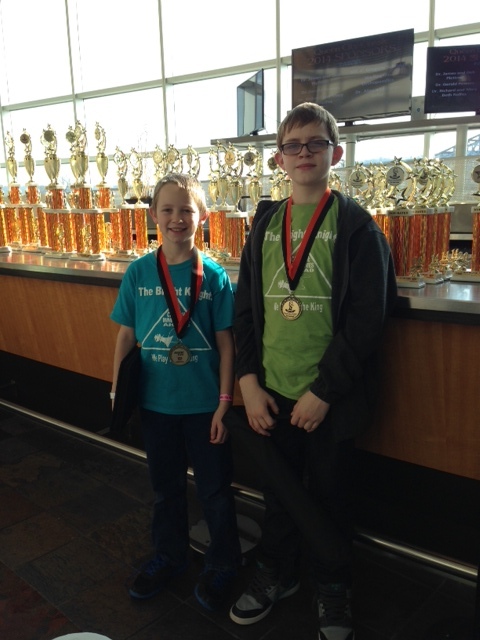 T and S after finishing up the chess tournament. S and A had to dress up as their favorite fictional character for a school assignment. 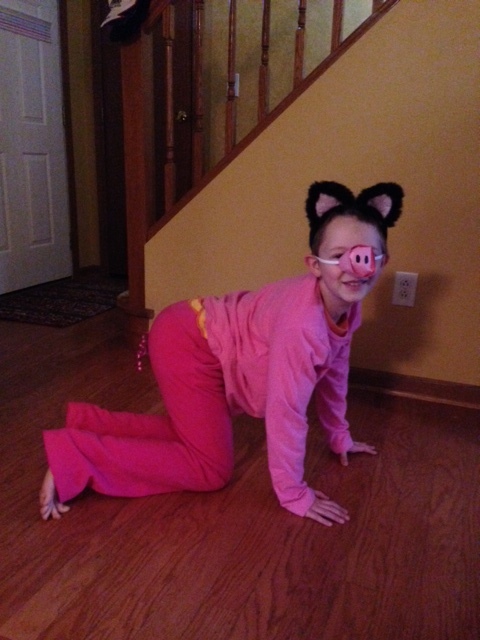 S read Charlotte’s Web and went as Wilbur the pig. 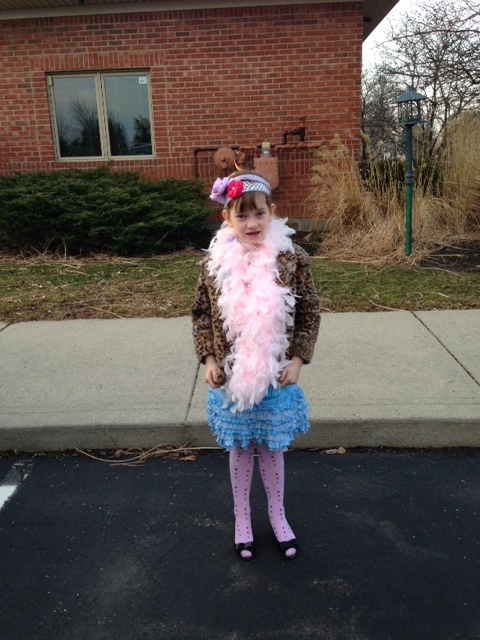 A read all of the Fancy Nancy books that our local library had and then dressed up like her. A dressed as Fancy Nancy. 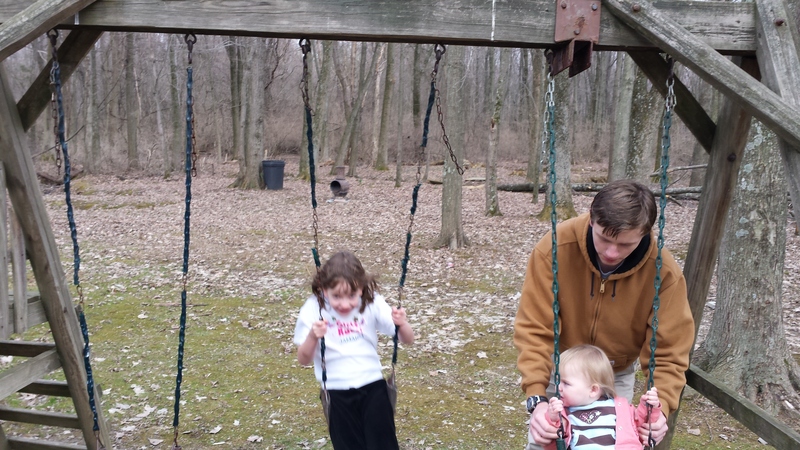 Here is M being nice and pushing the girls on the swings. L just loves him. She calls out his name a million times a day and I have to remind her that he is in school. 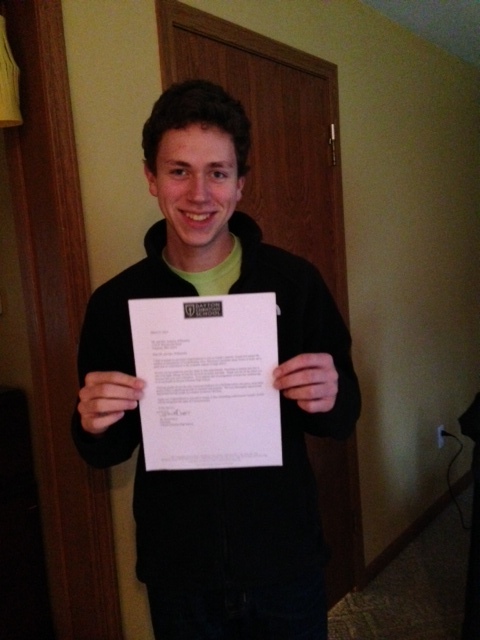 He just signed up for PSEO, so he will be taking 2 college classes next year. He will only be a junior in high school next year, so by the end of his senior year, he will have about a semester of college credits completed! M being a nice big brother and pushing his sisters on the swings. R has been working on his forge. We recently were able to acquire coal which has really opened up his options as compared to the charcoal which he has been using. It burns much hotter than the charcoal did. 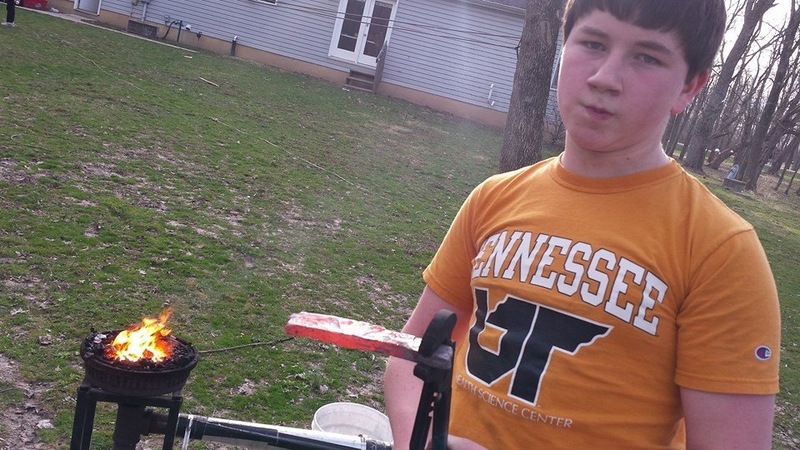 R working on his forge. Anyway, that is some of the things that we have been up to. How about you, what have you been up to? My husband and I have been changing the responsibilities of our children. He thinks I am too easy on them. I do what I have pretty much always done. I cook, I clean, I do laundry, I grocery shop. I do all of the mom stuff. Since I don’t work outside of the home, I feel like it is my job to keep things looking good around the house. My husband feels entirely differently. He feels that our big boys 17, 16, almost 15, and 12 are very capable of doing chores etc. around the house. I know that they are capable. I know that they can do chores and they have several that they are each responsible for taking care of. They don’t always do the job to my expectations, of course, they are kids. We are working on it. My husband thinks that they grow more and more capable by making them step up and handle more responsibilities. He is right. I know down deep that these kids have to be able to take care of their laundry, be able to cook, and clean a dorm room or apartment, etc. The hard thing for me is letting go of the stuff that I have always done. I always did the cooking. Now one child does the cooking each night. I’ve always done the laundry. Now the kids are taking turns. They must wash, dry, fold, and have each child put their things away. I’ve always cleaned the kitchen and started the dishwasher. Now the children do it. It is a big relief to me mentally to know that I am teaching my kids how to manage on their own, but who is with me that it is hard to follow through with it. It is hard to see them running low on clean laundry (they don’t seem to mind), it is hard to stand there in the kitchen pointing out all of the stuff that needs to be cleaned up after dinner and not do it yourself. It is hard to see them struggle with something that I could do quickly and easily. I have to keep my eye on the big picture. They will be moving on soon enough. I have to prepare them to the best of my ability to be successful with all things. Boys need to know these skills. How about you, did you prepare your kids to be out in the real world? What are the critical skills that they should know? 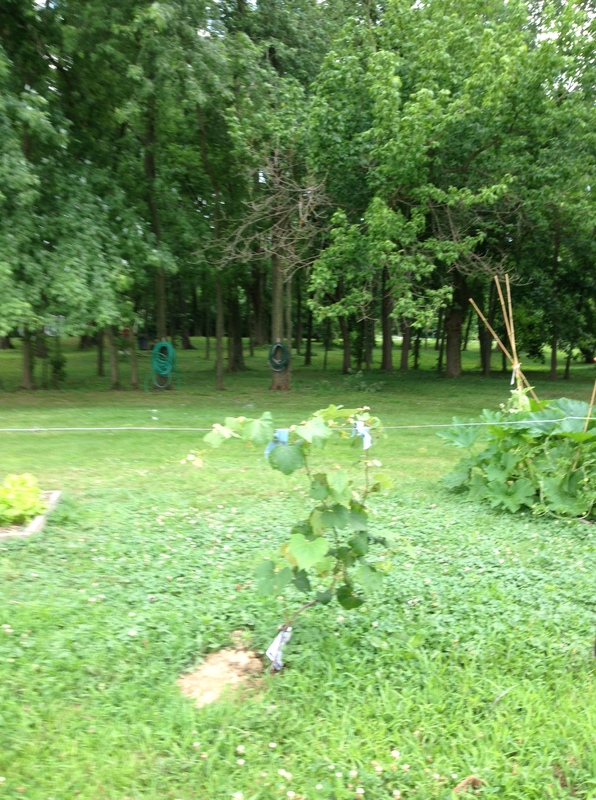 I have been wanting to add some fruit trees or bushes to our garden area for some time. At the same time, I’m kind of scared to do it. Trees are fairly permanent and I really have no design for how I would like things to be. I am more of a fly by the seat of my pants gardener. I want a lot of different stuff, but it all takes time and money. I don’t always have the time or desire to work after I have hastily purchased the crop. For example, for many years I bought all of the garden stuff–miracle grow, compost, bamboo stakes, etc. only to be gung-ho in the beginning and then it is a huge mess of weeds by the end of the growing season. I am trying to mend my ways. This year I finally purchased the grapes that I have been wanting off and on for years. They were on clearance from Lowe’s for $3 for a gallon container. I am super excited. I have been reading about growing grapes in our area. 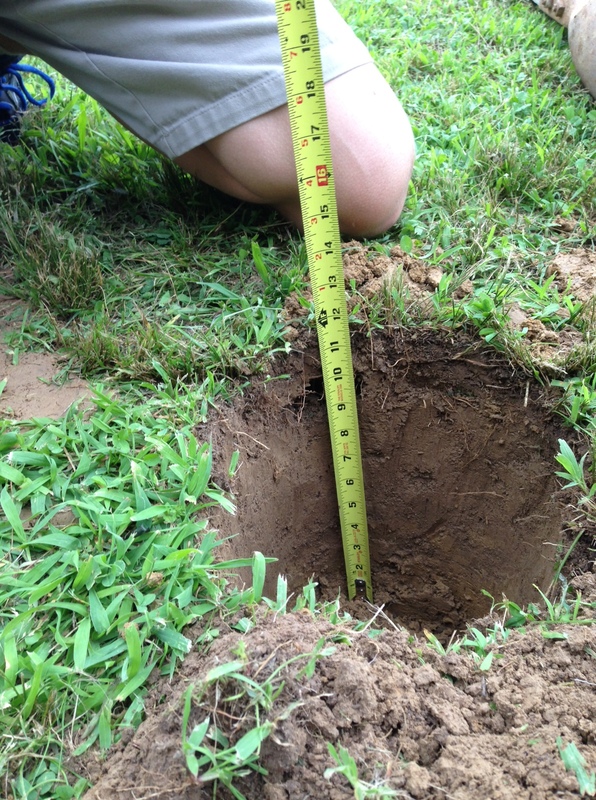 I purchased a soil analyzer. Our pH is 7. I never knew that before. Grapes here like it at 6 to 6.5. Thankfully, not too much of a difference. I just found out our neighbor has grapes that have done well, so that is encouraging. I enlisted the big kids to help me get going. They dug the holes for the plants. 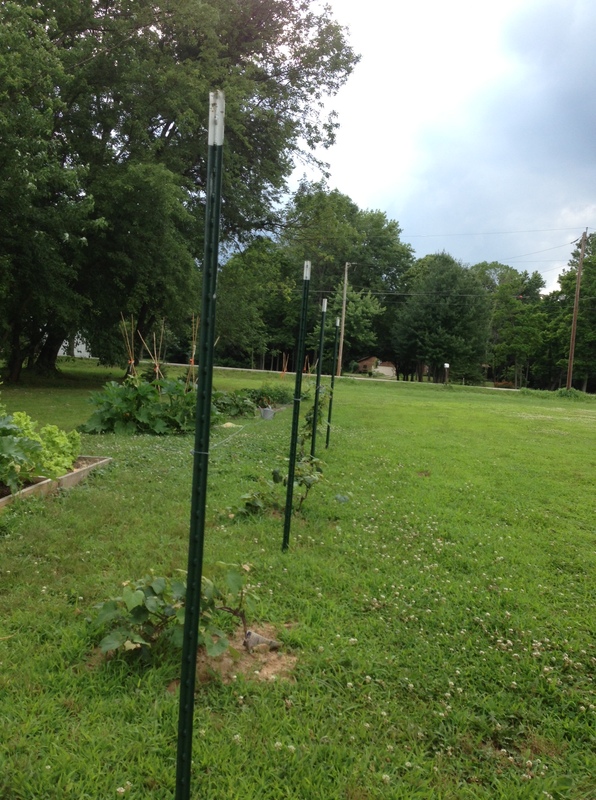 They drove the fence posts into the ground and A actually put the plants into the ground. She is such a plant lover. She notices every flower we pass. She loves being in the garden. She is all about the details. For example, I had the kids dig down one foot. We placed some soil acidifier in at the 12 inch mark, then replaced about 6 inches of soil to let the roots get started. 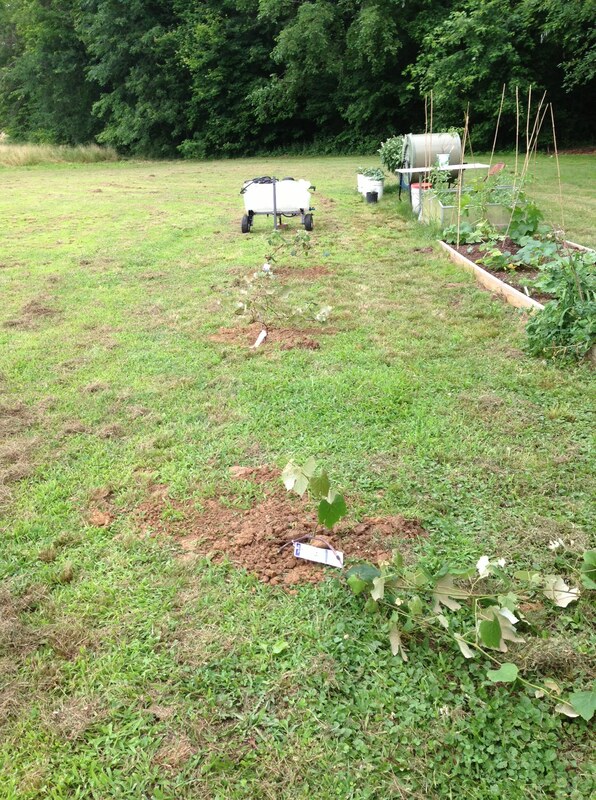 As we replaced the dirt, A sprinkled the rest of the soil acidifier around the grape bundle. We did this same process on all 3 plants. She watched each boy (the 3 older each did one complete plant). She made sure they had all of the steps done in order. She corrected them if they went out-of-order or didn’t do everything exactly correctly. They get annoyed with her, but she pays attention and knows what to do and when to do it. Concord Grapes bought on clearance for $3 each. Making sure the holes were dug 12 inches deep. 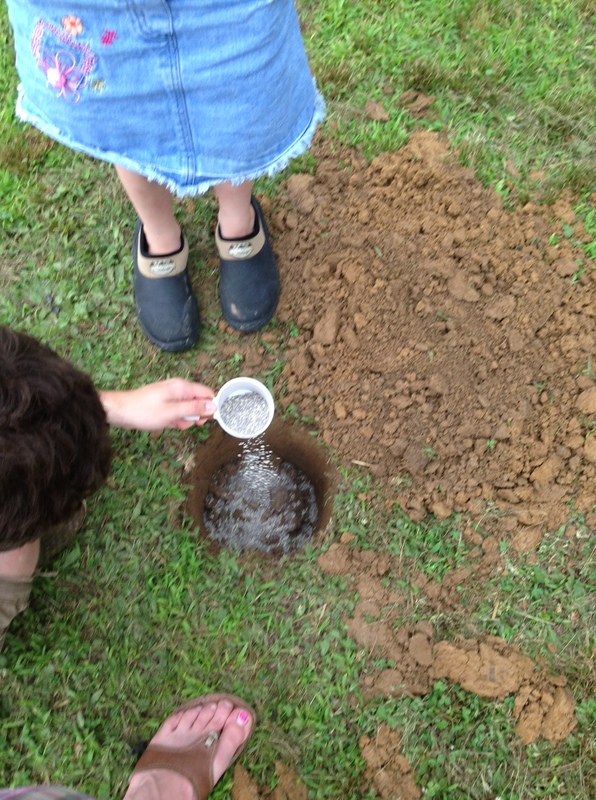 Sprinkling soil acidifier in the soil. A explaining the process to J. 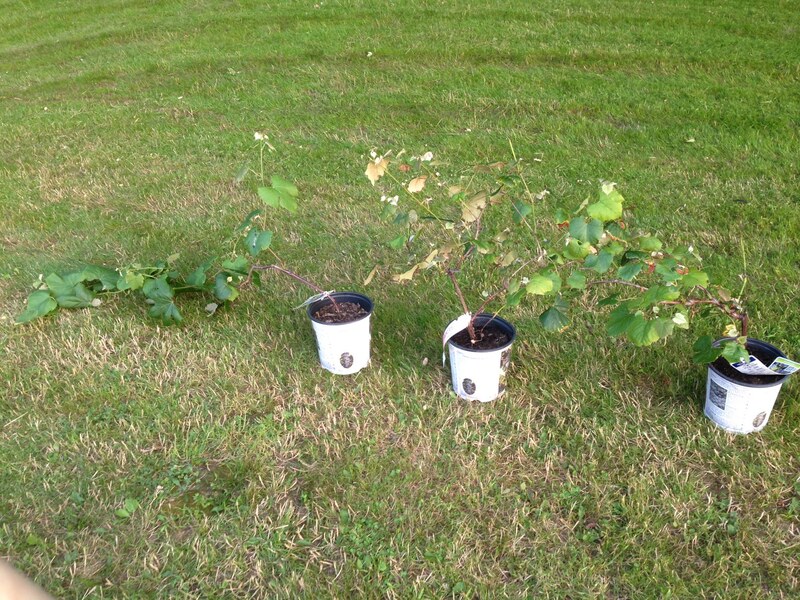 After planting, but before we had them up on the wire. Grapes strapped to the wire. I am back for a post or two until the kids get out of school. I should have more time for posting during summer vacation. Let’s hope so, I miss blogging! Where to start… I have been super busy with the kids. 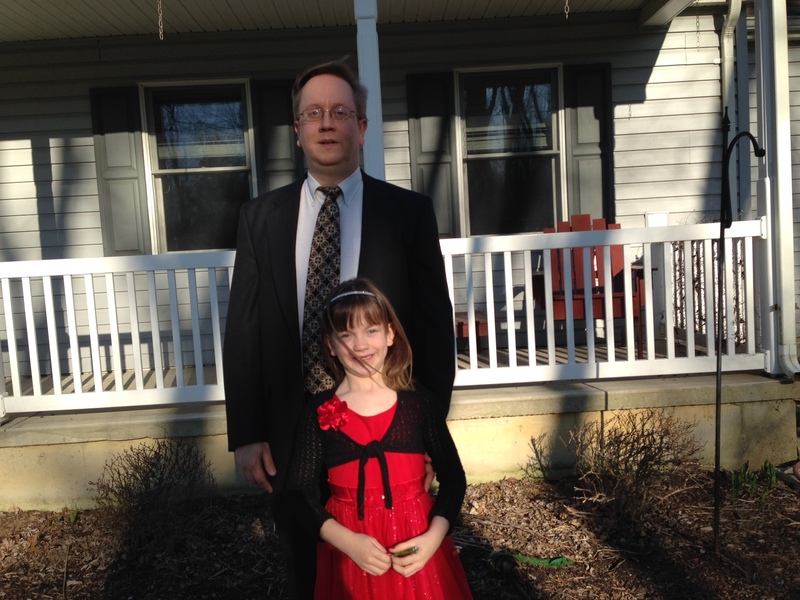 A went to her first father/daughter dance. She absolutely loved it. 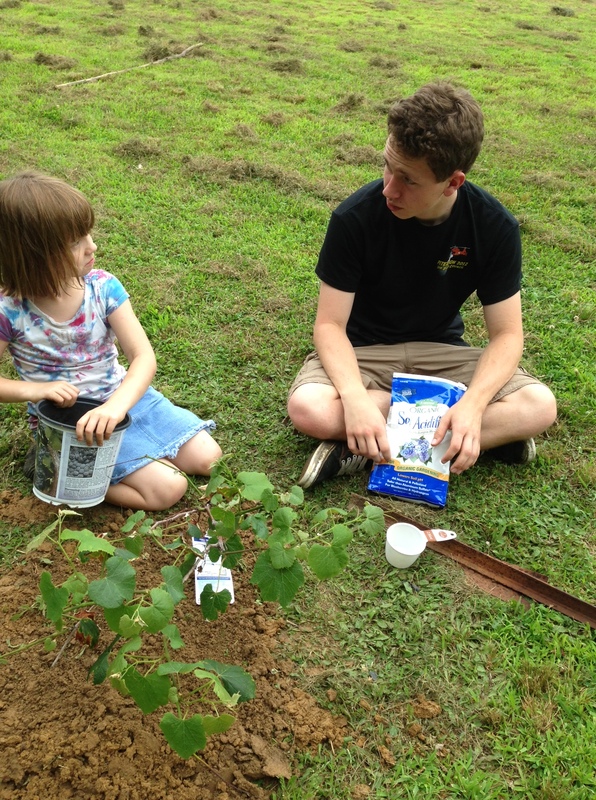 M is still working on his Eagle Scout project. My husband went to California for a week. 4H is in full swing and J is our club president! AHG is winding down now, just the awards banquet left! L is rolling over now. My husband is helping me with household updates. 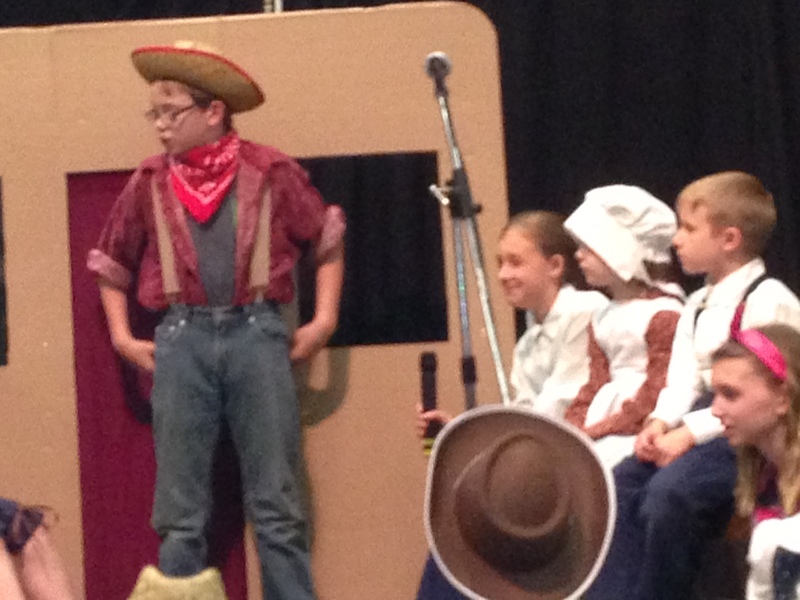 T had his school musical. 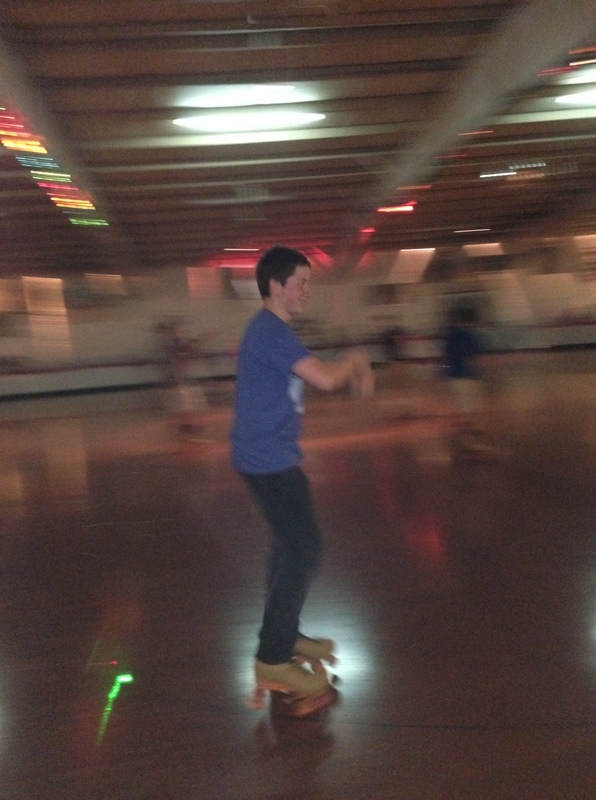 The kids went roller skating with our 4H group. We have also had a couple of neighbor dogs that keep going after my chickens. Killed 2 roosters in the first attack and killed 4 hens on the second attack. I am still very angry about it. We bought 2 turkeys, 3 guineas, 3 Bantams, and 7 miscellaneous pullets to replace our dead chickens and build our dwindling number of chickens. Here are some pictures of what’s been going on around here. 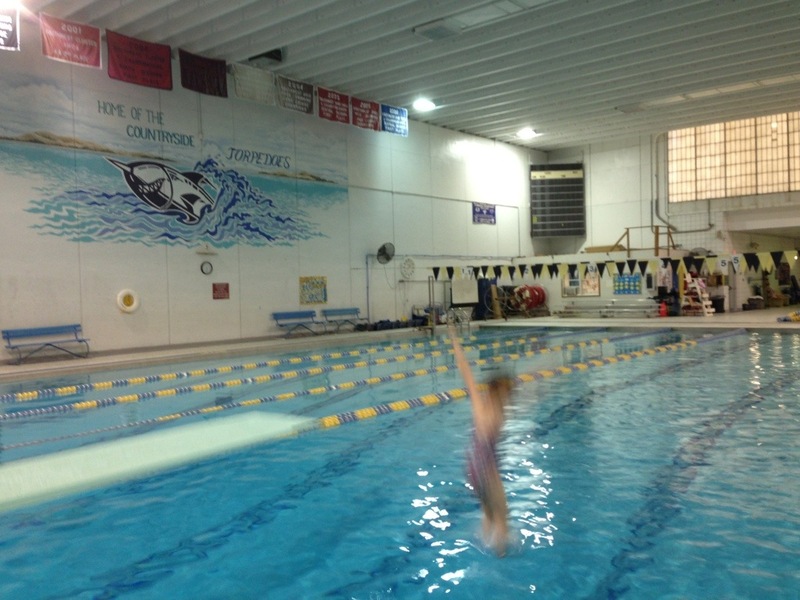 A jumping off of the low diving board. 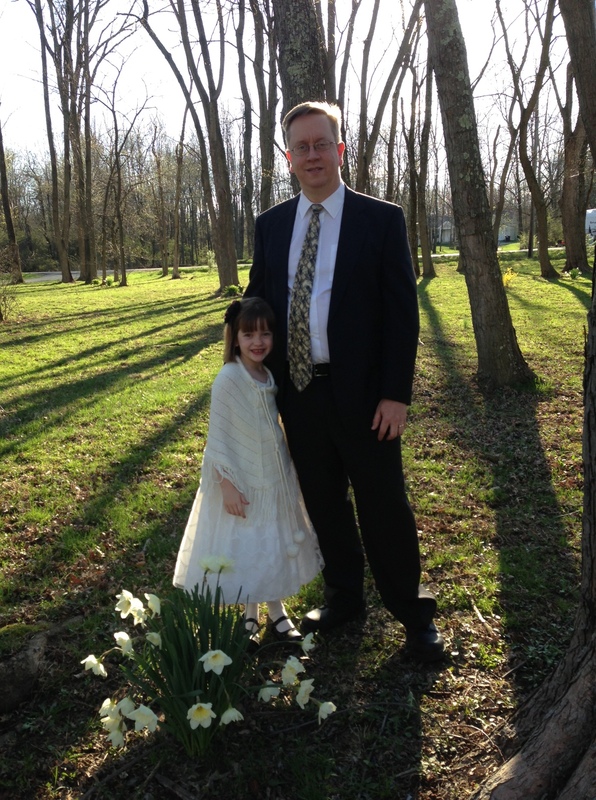 A going to father/daughter dance with my husband. 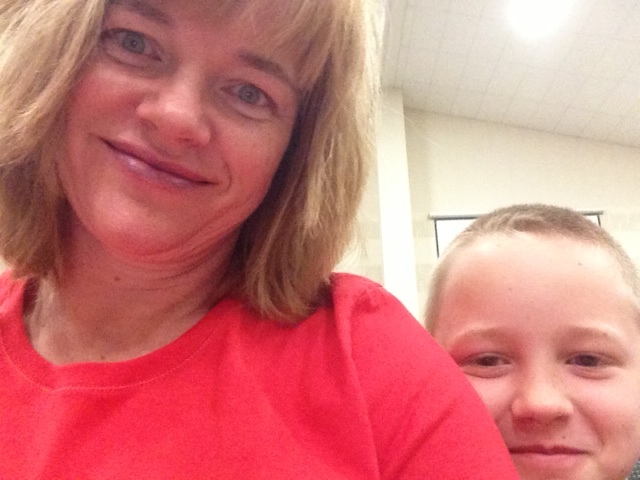 T and A in school musical. A cute picture of S and me. 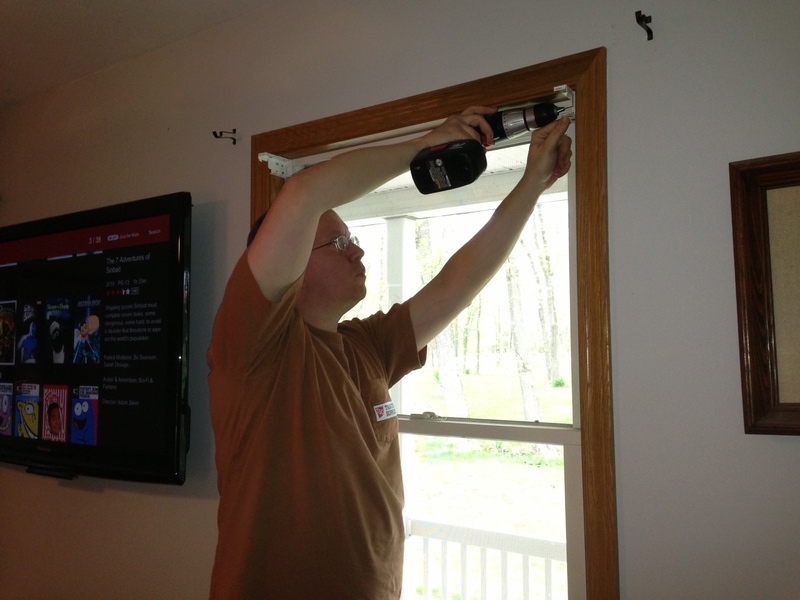 My husband putting up blinds. L rolling onto stomach. 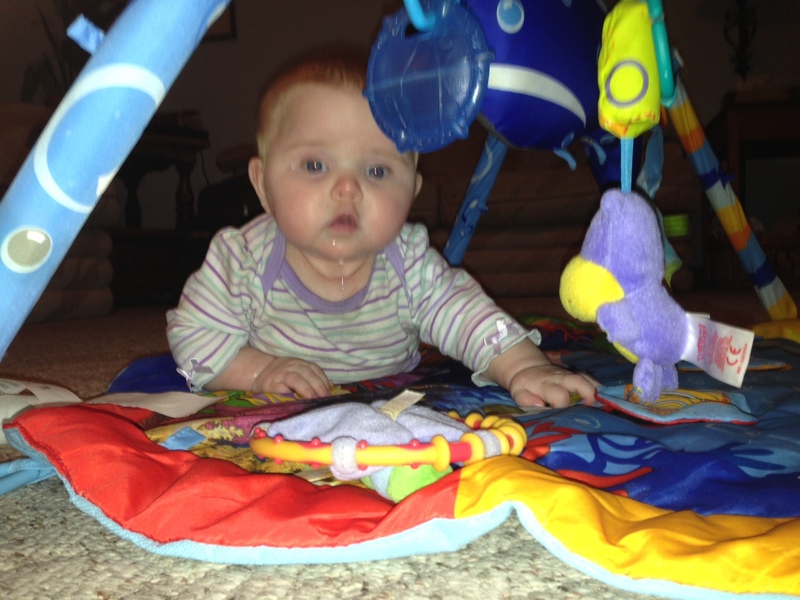 She is a drooling machine. 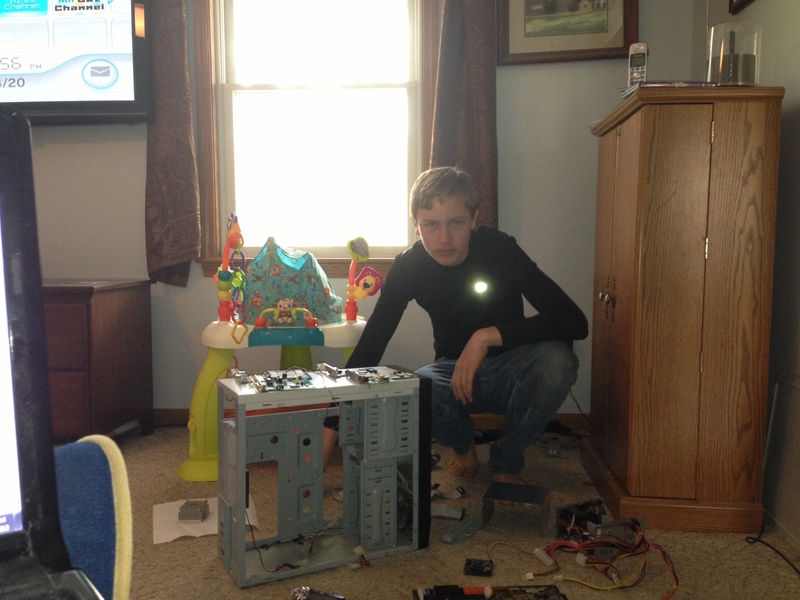 M working on a computer. We had a wonderful visit from my parents for Easter weekend. Saturday was absolutely gorgeous. I am beginning to think that Spring really is coming to our neck of the woods. 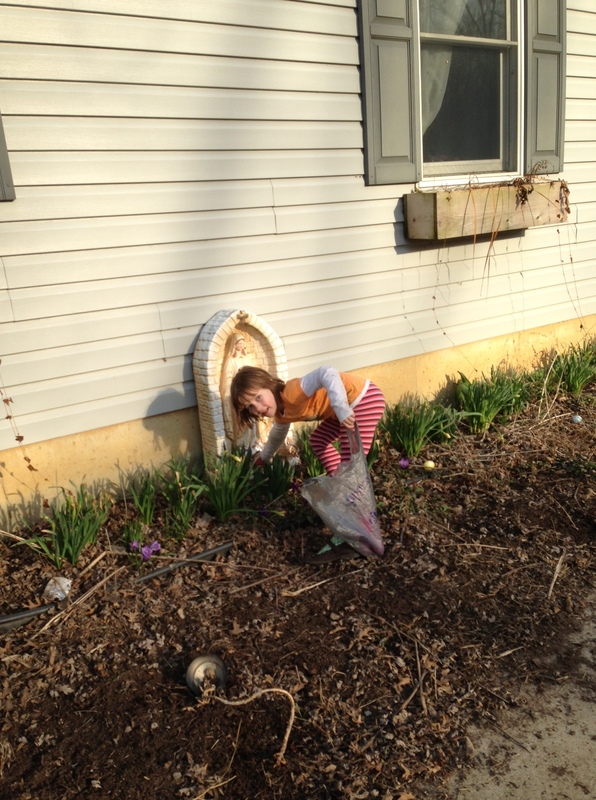 With the forecast for rain on Sunday, we had an Easter egg hunt on Saturday. The smaller three had a bunch of eggs hidden around the yard that have different amounts of change in them. The bigger three have one bigger egg that has a $10 bill inside. 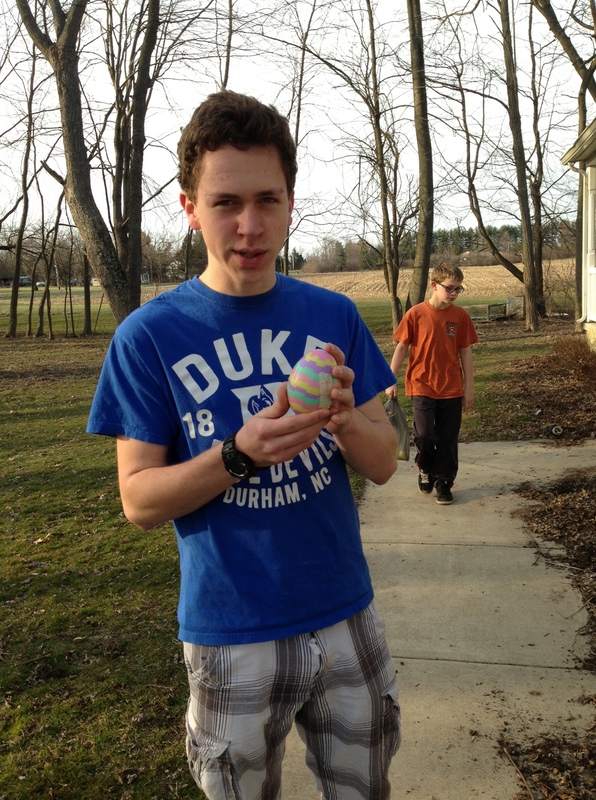 No one seems to be too big to find an egg with 10 bucks inside! It was fun. 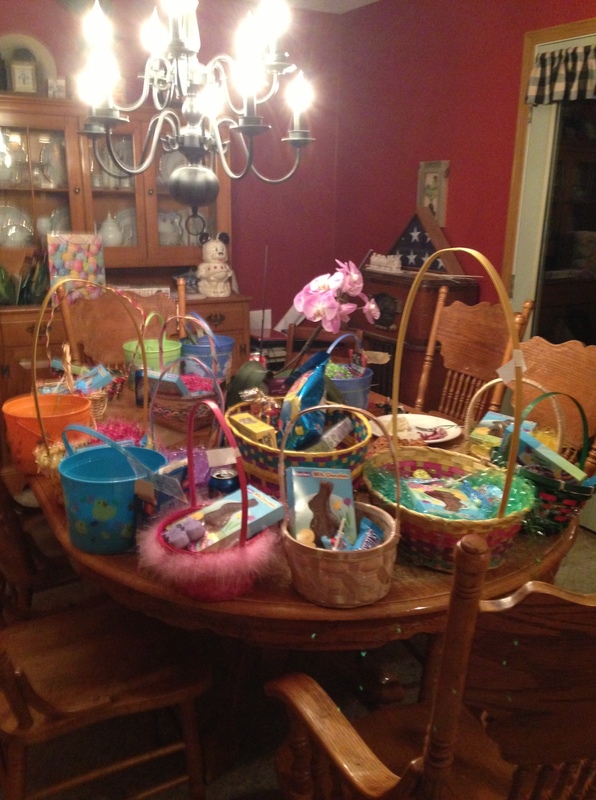 The kids all end up with $10 and they love doing this every year with my parents! 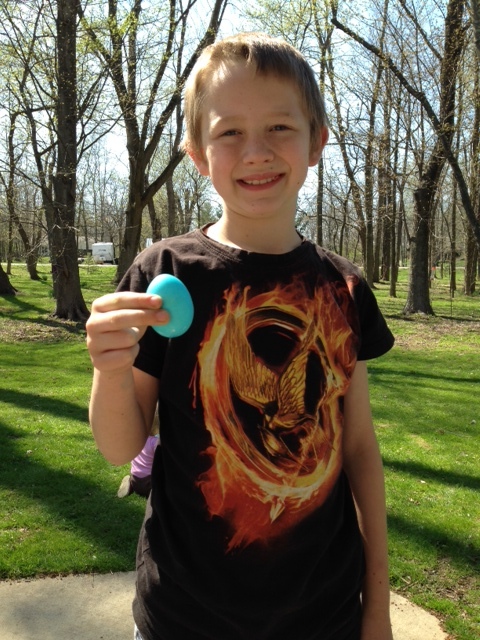 J with the $10 egg! 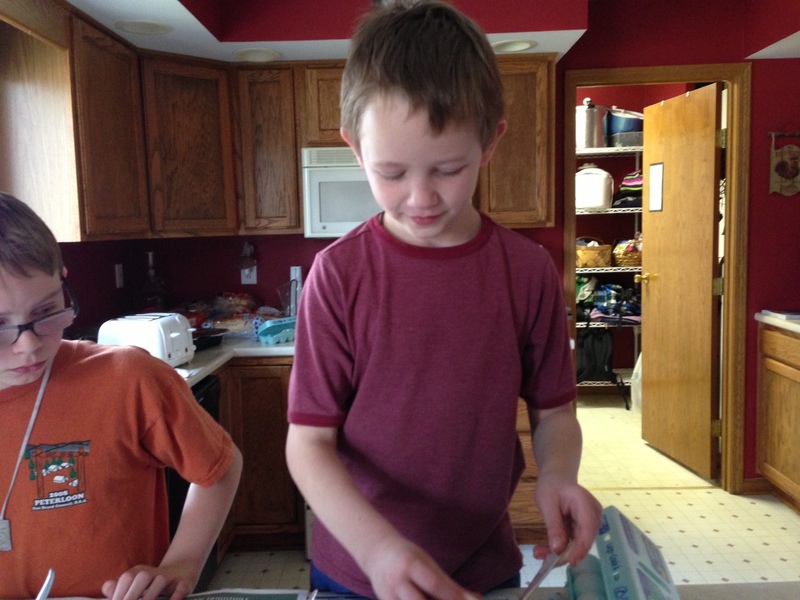 The three little kids helped me make Easter Nests on Friday. I got the recipe from Food.com and got the ingredients beforehand. They liked making them and they were festive. Here is a picture of how they turned out. 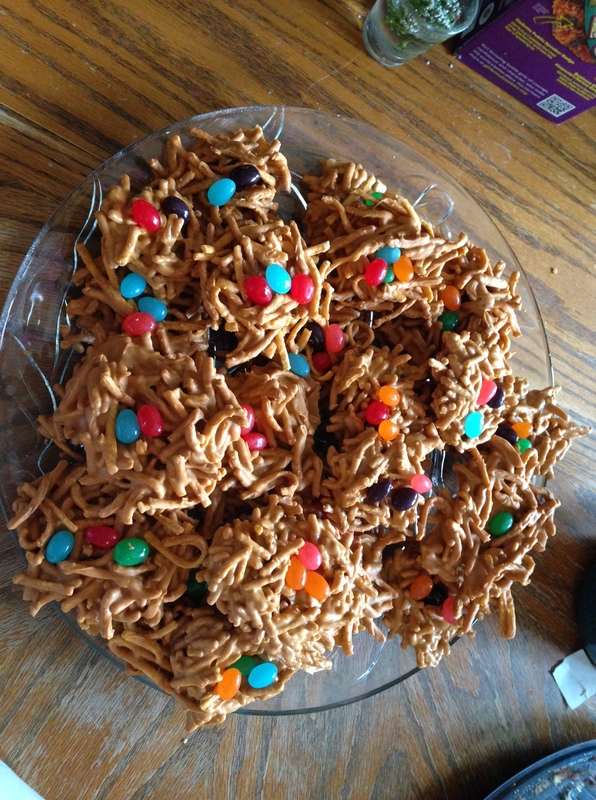 A plate of Easter nests. Here are a few pictures from the weekend. Fun was had by all. 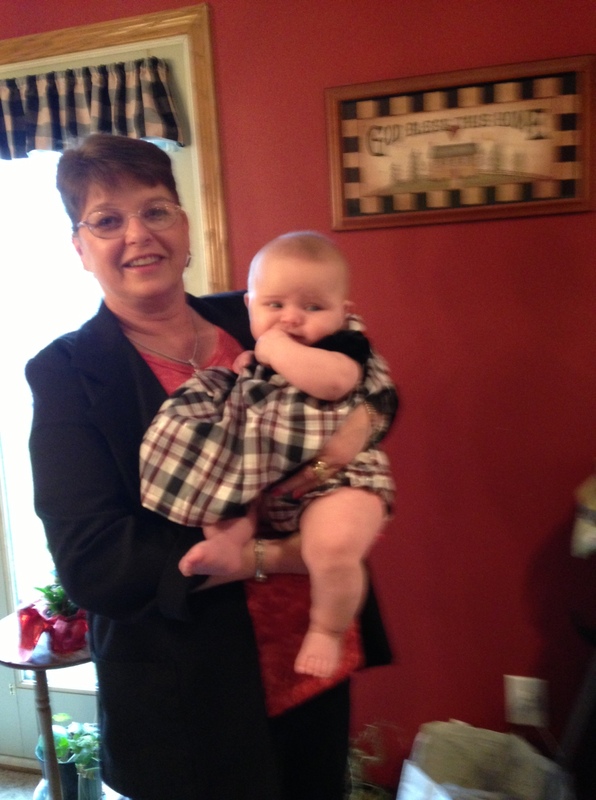 It was great to see my parents and have a wonderful Easter celebration! Mom and L. Look at that chubby leg! 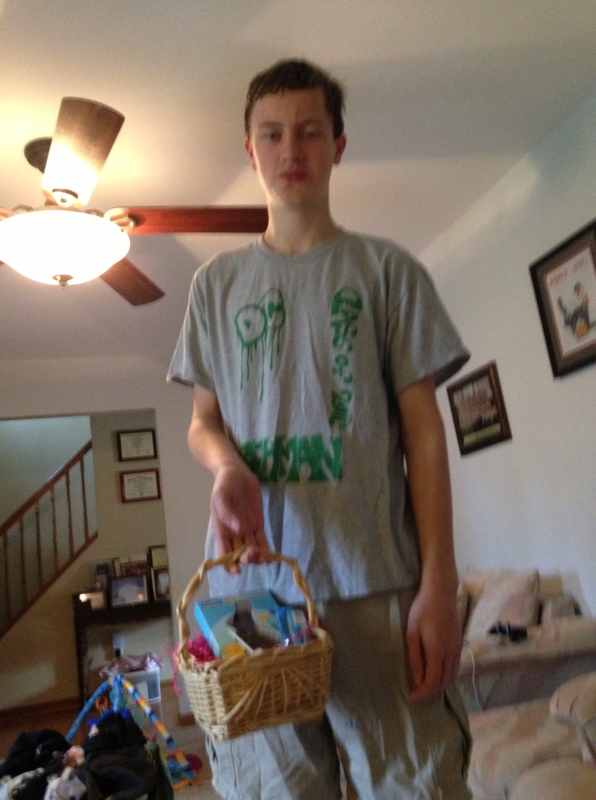 R with his Easter basket. 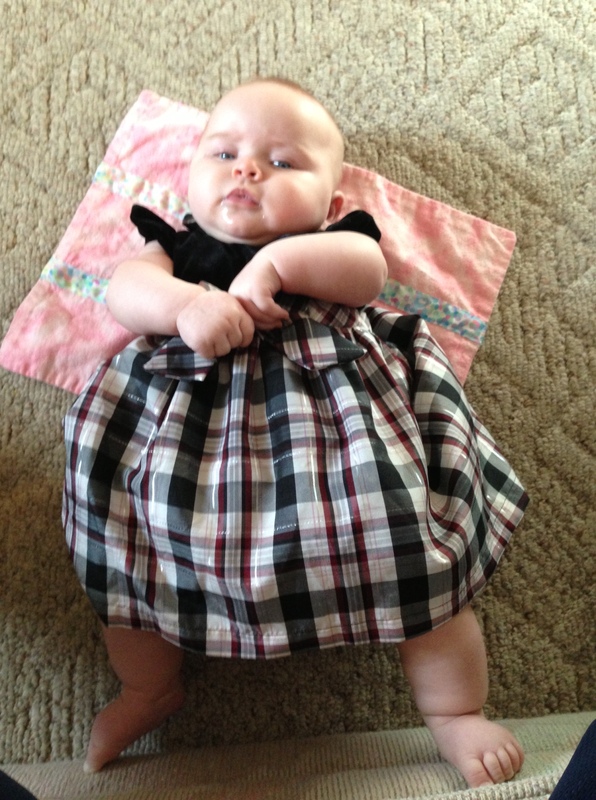 L in her Easter dress. 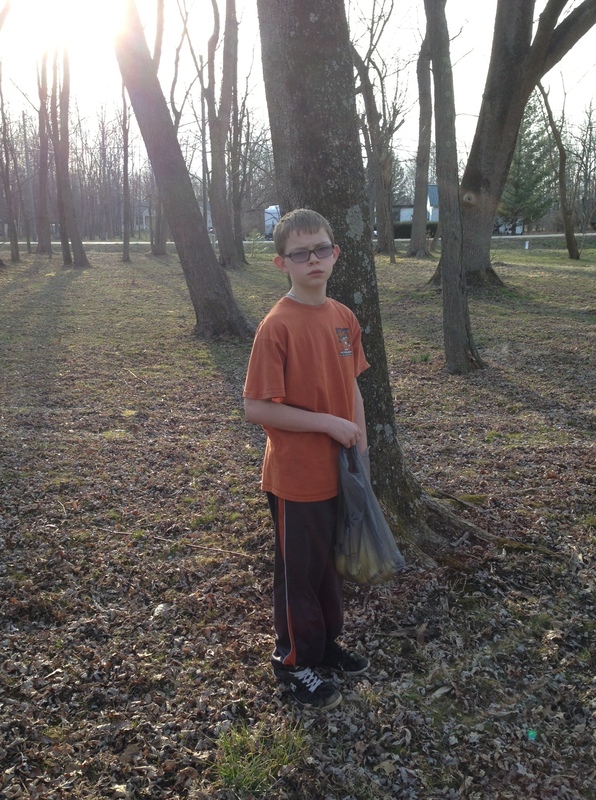 T was sick vomiting overnight, so he didn’t have much energy for the egg hunt. Too much Easter candy! We are so blessed to have a wonderful family. 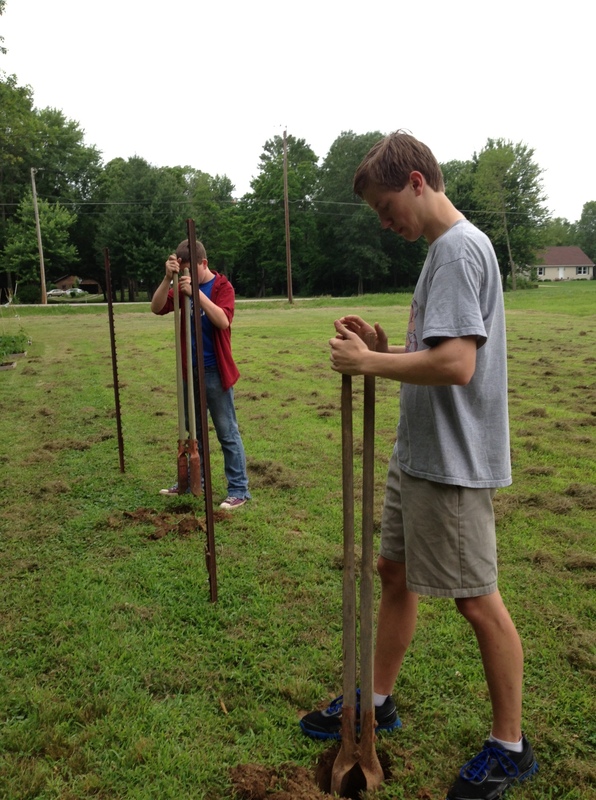 M has started the process of working on his Eagle Scout project. 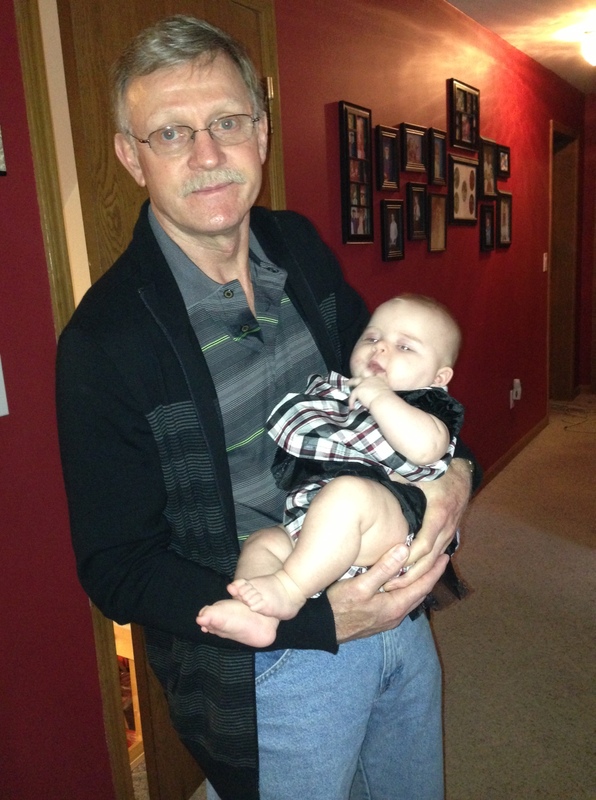 There is going to be a lot of hard work in his future!